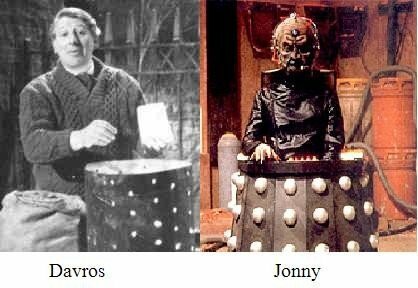 Regular readers of this blog will know where I stand on the Doctors before Hartnell theory. I stand very firmly in the “who cares?” camp. Here we are in 2011, and we’ve reached Number 11. Yet I remain phlegmatic. When you’re practically immortal, the only end of age seems an impossibly long journey distant. To you, a thousand years old can barely be conceived. To a mayfly, you are the god. Today, I face my middle-age with equanimity. The flaw, perhaps, is that living fast means dying young. Borusa escaped, after a fashion, by challenging Rassilon, his continued existence evidenced by the furious flashing of his eyes. The Master took one life for thirteen more. On the whole, though, it’s unlucky for most. And so, what must a Time Lord do when time finally runs out? Cheat, of course. This is an unpublished drabble that I wrote in July 1991. Like one of those published in 1993, it’s an acrostic. It’s a lot less subtle than I thought it was when I wrote it. Don’t expect any charitable contributions from us – we’re the guys in the black (and gold), and the only thing we’ll give you is trouble. Asking us for favours, you’ll soon come to realise, is as productive as trying to squeeze the contents out of a sealed tin can. Look us in the eye, and we’ll stare you down in unblinking, uncaring incomprehension. Exterminate any hope you may entertain of a deal – and if you dare to take the plunge without prior permission, we’ll give you some stick. Kindly don’t argue when we roll up again: we are Terry Nation’s muscle. In a recent tidying session, I found a pile of stuff I wrote in 1991. Some of it appeared in Drabble Who, a collection by Beccon Publications (1993) that raised money for the RNIB Talking Book Library. That book had nearly 100 contributors, including people who had worked on Doctor Who in the past, some who would work on the show in the future, novelists, editors, and enthusiasts like me. 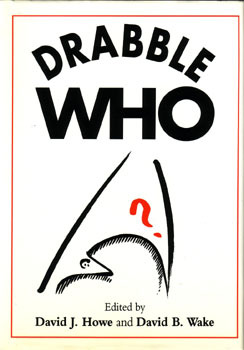 Drabble Who is out of print, and will not be republished, so I think that over a decade and a half later it’s safe to blog my two drabbles here. And then later, I may publish the three that I wrote but they did not use. The first one is “Mark Four”, a typical bit of fan fiction enthusiasm. The second, “Initial paragraphs from a draft letter to my oldest companion” is an acrostic, the effect of which was rather spoiled on initial publication because they indented every new paragraph. It also has a theme that would later appear in my novel Frontier Worlds. Working from memory isn’t always easy, but working from reports is perhaps more difficult. A few months’ effort, though, and you’d have thought I’d had blueprints. One last minor adjustment, and the lights blinked on. The tail aerial wagged a wary greeting. The radar sensors pricked into life. I flicked briefly over the tongue of ticker tape. “Old technology. You’re a collector’s item already.” It hummed, a mechanical question in a rising note. “I hardly suppose I need to introduce myself,” I murmured, running a clean finger along the burnished black casing. Theft and disguise started my career, I suppose, though appearing first on that monochrome world Earth established my distinctive style. Afterwards, my look changed several times – shifting shades of light and dark, subtle variations of line and effect, though I could on occasion transform completely, be unrecognisable, camouflaged or transparent even to you. Recognition’s rarely a problem now in our spins around the universe. Doubtless my looks belie my age, but then you know I transcend more than expectations. I’ve known many of your friends, Doctor, yet remain your truest companion. Sharing the changing times is what keeps us close.